Cornerstone Auto has become a well established neighbor to Elk River, Plymouth, and Monticello areas providing our customers with top brands of new and used vehicles including Chrysler, Dodge, Jeep, Ram, KIA, Chevrolet, and Ford. As one of the largest automobile dealerships in Minnesota and the Twin Cities area, we are committed to customers satisfaction and strive to help with peace of mind when purchasing their next vehicle or in the need of vehicle service and maintenance by creating a safe informative and honest experience. Other benefits include new vehicle guarantees, complimentary vehicle history reports on used vehicles, certified inspection reports, compimentary diagnostic services, and more. There’s even a complimentary car wash with every service visit! Although the name Cornerstone has only been around for the past few years, we’re a family owned business that’s over 50 years old. The company was founded in the early 1960’s when Oran Powell built Brookdale Ford, in Brooklyn Center, the largest Ford dealership in Minnesota for more than 35 years. Over time, the company grew to include numerous Ford and Chrysler-Plymouth dealerships in Minnesota, Wisconsin, and Iowa. In 1972 we acquired Elk River Ford, our longest continuously operating store. Scott Powell, Oran’s son, became owner and operator in 1983. We expanded in Elk River with a Chrysler and Dodge franchise in 1989, followed by Jeep in 1998, and finally KIA in 2009. Today, we are the only new car dealer within eight miles of Elk River. Since 2010, Cornerstone has added a pre-owned location in Plymouth and a Chevrolet store in Monticello. A third generation of Powell’s is now continuing the family legacy of automobile dealership management. Even though Cornerstone Automotive has become a strong and successful business, we cannot stand still. And we aren’t. Change is constant, maybe especially so in the car business. Customer preferences, economic conditions, new car models, technology, competition and, lately, the Internet are reshaping the auto landscape. Even though there will always be change, our values will hold true. Determination, hard work, doing what’s right, striving always to improve, and a deep commitment to serving others – these are the things that will continue to define who we are and who we will be. We are a faith based organization that is honored to serve everyone, regardless of their religious affiliation. We live our beliefs through acting in accordance with our Mission and Values Statements. Our Cornerstone Team is the most valuable asset we have and they are the reason for our success. We are a family run business and treat our customers the way we want to be treated. We are Cornerstone Automotive; this is who we are and what we do…Every day. 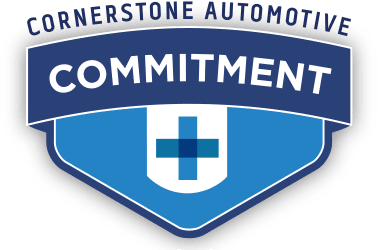 Cornerstone Auto has a rich and unique history of being family owned, a commitment to customers, and creating long lasting relationships with our customers and their families for generations. Learn more about Cornerstone Auto by viewing the videos below. At Cornerstone Auto, we have strived to build a business on good values and treating people the way that you would want to be treated. Our faith based family-owned business has become a basis for our mission, our purpose and has allowed us to create values that we enstill in our employees daily. Cornerstone Auto operates on Christian-based principles. We know of no better role model than Jesus Christ. The life He led inspires us. He made his relationship to people his top priority. It is our desire to do the same. The principles he taught are the foundation for our decisions. We respect the uniqueness of all people and we serve the Lord by treating employees and customers the way we would want to be treated, with honesty and integrity. We appreciate the opportunity to earn your business and serve you and your vehicle. Thank you. We help people live life to the fullest – safely, with peace of mind. WE HELP PEOPLE GET WHERE THEY WANT TO GO,</ class=”abs-center”span> DO WHAT THEY NEED TO DO. Hold a job, get a degree, build a career. Go across town. Or see all of America. Moms, dads, kids. Friends, colleagues, and customers. Together for fun or work, then home again. WE GIVE PEOPLE PEACE OF MIND. To go safely, worry free. With each other, our customers and our communities. DO WHAT’S RIGHT, WHAT’S HONEST. Do the ordinary extraordinarily well. Now, not later. Keep things easy, enjoyable. Hear the questions, concerns and insights of all. Mobilize the power of “us” to deliver on our promises. The people are great. The service is great They even give you a free car wash with even the smallest service. They don't get 5 stars because the wait time was 4 weeks for an appointment. That is far too long to be without working transportation. I had to go elsewhere when my truck was not driveable. Nice place, they have some good cars.